A less-dense section of forest on Falalop. “Anywhere outside of the village is the forest,” Mariano begins. “This is true on each island. We have two names for the forest. We have lliuwel, meaning ‘the area where trees grow,’ or liuwelwaluwol, ‘in the bushes.’ Lliuwel is just forest in general, lliuwel. If you use liuwelwaluwol, ‘in the trees’ or ‘in the bushes,’ then you have to indicate or give a place name. And most of the island both of these terms are used almost every day. And anybody can use the forest." “Over on Sohl’oay we have a totally different kind of forest over there. We have iron tree. We don’t use these words for forest for that. We have to indicate ‘among the ironwoods.’ Ironwoods grow in sandy places. And they can also grow in rocky areas. “We use the ironwood sticks for husking sticks. The bigger ones we use for house posts. We use it also for other sticks that we call halleewa, that we put on the canoes. In case something breaks, then that’s what you use to tie it. This is not the long pole, but according to the size of the canoe, it would be shorter sticks. "And every canoe carries them on board. Because even the sail, the mast breaks, then you need two pieces, or several pieces of this and then you tie it.For the masts, anything that breaks on the canoe, you can temporarily use that, and that’s what it’s for." 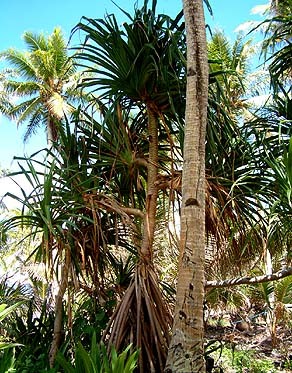 Wild pandanus on windward Fedraey. “On the windward side of each of these islands, all these islands, there are wild pandanus trees. They grow in the tough places. Even on the rocks. And the windward side of these islands, that’s the rocky side. They can grow there because their roots can go through the rock. We also use it as a means of protecting the the islands from the sea spray. “Not everybody chewed betel nut in the past. Usually those who travel to Yap. Not much grows here. Usually, those who had a bid on the trees by their homes in the past, were the ones that usually visited the sawey in Yap. 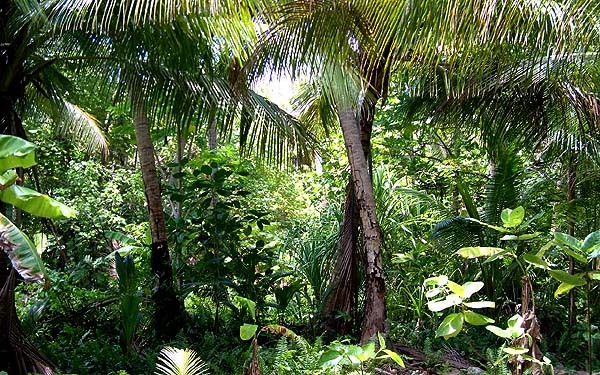 They tasted it in Yap, they became addicted to it, so they start bringing out these young betel nut trees and planting them around their houses, or on their parcels of land in the forest. 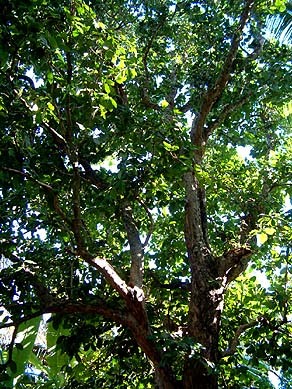 “There is a tree we call in English the ‘alligator tree.’ The fruits’ skin is like the skin of a green lizard tree, but we have called it the ‘alligator tree’ in English. We have our own name, we call it yabuuch. I don’t know what that means. The alligator tree, and mountain apple trees, it is said that these types of trees, although their branches are easy to break, their roots hold the ground firmly. "So families here usually grow these types of trees close to their homes. In the event of storms or typhoons, super typhoons, when the sea water gets over the island, each family would tie a strong rope, which is usually kept for that purpose, to these trees. And the members of the families will hold the rope, try to tie themselves to the rope. The strongest of the family will be the last, at the end of the rope, so that if the weak and smaller children slip away from the rope, he can grab them during the storm. “Now these ropes are inspected regularly. If, perhaps a rat has gnawed just a little bit of this rope, it will be replaced with a new one. And it is hung in each home. Sometimes, even if animals don’t get at it, or insects don’t get to the rope, but it is time to be changed, then it should be replaced with a new one. So that it stays in good condition. I forgot, they’ve got a name for this type of, there is a name for it, which says something about, something like ‘the rope to pull,’ something of that nature." 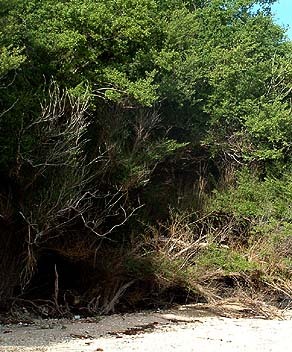 “Almost all these trees that we have here on the island, we use for medicine,” Hosay says. 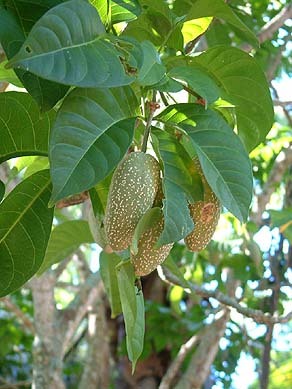 “Breadfruit, we use the very young leaves. Young leaves of the mahogany, they use it for diarrhea and that’s one medicine that I believe really works. For diarrhea. “There are some trees that mostly we use for medicine. There is a tree called l'ool, we use it for medicine. And the coconut tree is also used for medicine, from the bark of it. And also that tree we call hal'aw. We use the bark, and the leaves. The leaves we use for when you’re hit by something and it swells up, you just pound the leaves and apply that. "And some people also use it and put it in the l'ool leaf, big leaves, and they tie it up, close it up and tie it up and heat it on the fire." 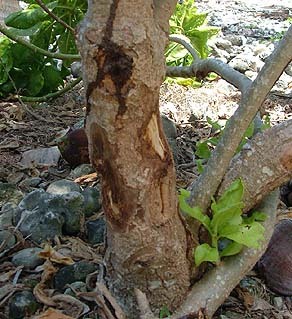 When bark is taken for medicinal purposes, one uses the lowest bark on a mature tree. This lath tree shows signs of being used for medicine. Trail through the forest in a remote portion of Falalop. “I am supposed to know lot of medicines, because there was one old man who keep on telling me what each thing cures. But he had already pass away when I started thinking about it, but now it’s too late." “Some of these plants were kept secret,” Mariano adds, “and the knowledge was passed down only through the families. Especially herbs for that are for internal sicknesses. We have different types of knowledge of massage too. In the old days, this is how they get their ‘money': before this special medicine person will take care of this sick person, the family of the sick person will be providing things, giving things to the medicine man. "But general herbs for like scratches, sores and stuff, that knowledge can be passed around." Click here to read more about traditional medicine. 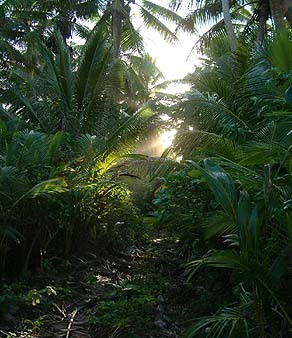 The weather and the forest combined affect water in Ulithi.